Pro Se Productions announces the first story in a new series in its PRO SE SINGLE SHOTS SIGNATURE line. The pioneer of what has come to be known as Psychedelic Pulp brings his mix of madness and adventure to digital singles. Chuck Miller, the creator of The Black Centipede introduces The Fabulous World of Zenith, a new and original series that will examine the world of the Black Centipede, Vionna Valis, Mary Kelly and Doctor Unknown Junior from a variety of strange and oblique angles. The first episode in Miller’s series focusing on the city in which his characters live and die takes a look into The Journal of Blood Mary Jane: My Florida Idyll. 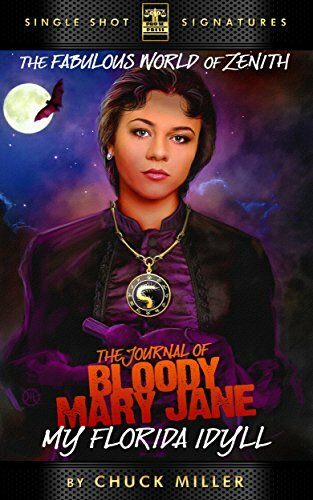 For the first time, the Black Centipede's closest friend and most implacable opponent, the mysterious and deadly Mary Jane Gallows, pulls back the shroud on her life in her own words. Thrill to her surreal encounters with Ponce De Leon, Cotton Mather, Professor James Moriarty, Grigori Yefimovich Rasputin, Mary Pickford, H. P. Lovecraft, and many others-- including her father, the diabolical genius known as Jack the Ripper. Featuring cover art and design by Jeffrey Hayes and Digital Design by Russ Anderson. Available for now for 99 cents at Amazon, Smashwords, Barnes & Noble, and www.prose-press.com.